Tunstall Corp. produces a full line of Float & Thermostatic Steam Traps containing a float valve mechanism which modulates to discharge condensate continuously, while non-condensable gases are released by a separate internal balanced pressure thermostatic air vent (The Tunstall Capsule®). The “FTH” series traps are designed for use in systems that produce an exceptionally large amount of condensate (625 to 24,000 lbs. of condensate per hour). 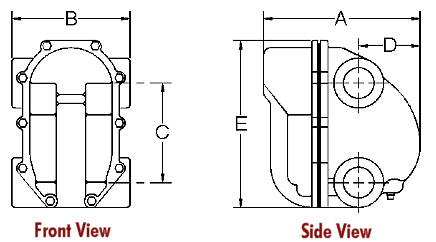 Two sizes (1-1/2″ & 2″) available for low, medium and high pressure applications with a “H” pattern piping connection for maximum installation flexibility. All Tunstall float and thermostatic traps can be serviced without disturbing system piping. Stainless steel balanced pressure thermostatic air vent (Tunstall Capsule®). Designed to withstand water hammer & high load demands.